Improved steam pumping allowed mines to go deeper. One of the first of the deep shafts was begun in 1841 at Cinderhill, and later at Babbington Colliery, north of Nottingham, where two 7ft-diameter shafts were sunk to a depth of 203m. Thomas North, the leaseholder, established a brick works there and built a new village, as well as an extensive internal railway system. Further north, the first deep shafts were sunk at Hucknall in 1851 whilst at the Shireoaks pit near Worksop the top seam was found at 316m below surface. More recently shafts at Asfordby, in the Vale of Belvoir, went to depths of over 500 metres. Sinking shafts in the concealed seam proved a costly and lengthy business however. In 1922, because of debts of £500,000, the Harworth Main Colliery Company were forced to abandon the sinking of Harworth and hand over to the Barber Walker Co. In 1868, Thomas North died over £190,000 in debt. Also, the new pits were much deeper, and as the business of mining became more complex, the pit tops covered many acres with a network of railway lines, taller headstocks and associated industries such as brick or iron works alongside, all dwarfed by the spoil tips. The number and variety of trades needed for the efficient operation of a mine increased so that bricklayers, blacksmiths, engineers, and, later, electricians became indispensable. By the 1880's the excellent house coal produced in the Midlands, and carried by rail to London, exceeded the tonnage of the traditional sea-borne coal from the North East. The prosperity of the coalfield was further enhanced by the location at greater depths of the Top Hard seam of good coking and steam coal, first in the Leen Valley in 1876 then, in the 1890's, by mines in the Mansfield district. Local coal was converted for use in blast furnaces to replace charcoal for the production of iron. Codnor Park, Morley Park, Somercotes, Chesterfield and Staveley had large deposits of ironstone, which was smelted in a dozen charcoal furnaces. By 1800 these had been replaced by a similar number of coke furnaces, which increased to 15 by 1827. By 1847 there were 30 furnaces, 20 of which were producing a yearly output of 95,000 tons of pig iron. The mining of coal, clay and ironstone from the same locality gave rise to several businesses, which became very large combines. The Butterley Company, originally Benjamin Outram and Company, by 1829 employed l,500 men. They had blast furnaces, a foundry and steam engine works at Butterley and similar works at Codnor. On top of that they owned three collieries and limestone quarries. By 1870 the company operated 15 collieries and their work force had expanded to 8,000, most of them accommodated in new purpose-built housing at Ironville. 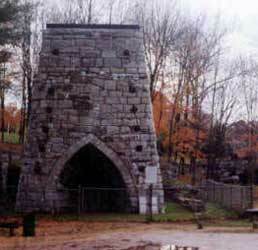 In the Chesterfield area, the Staveley Coal and Iron Company originated in the 1780s and traded in association with the Stanton Company. The Sheepbridge Coal and Iron Company was a later formation in 1864; by 1871 it was operating four collieries, which had resulted in the doubling of the population of Whittington in a decade. In the late 19th century, between Dronfield and Chesterfield almost l,000 beehive coke ovens were operating. But the end of the 19th century was a period of considerable change. Many of the older pits were either worked out or uneconomic to operate and many closures took place in the Erewash valley and the Dronfield and Unstone district. Also many of the ironworks became uncompetitive and switched to the production of coke and chemical by-products such as tar, sulphate of ammonia, sulphuric acid and benzol. This industry continues to supply metallurgical and smokeless fuel requirements. The opening of large fully mechanised mines, particularly in the Dukeries area of Nottinghamshire, involved the construction of new accommodation and facilities for the miners and families. 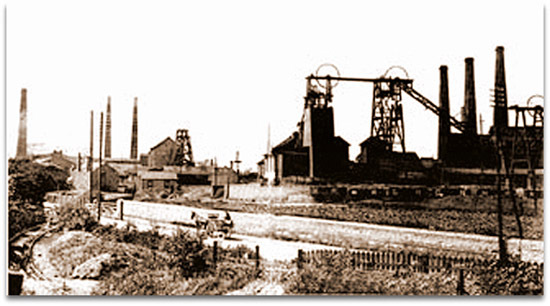 These new mines employed around 600 men each and the new company settlements, such as Blidworth, Bolsover, Clipstone, Creswell, Edwinstowe, Forest Town, Rainworth and Ollerton reflect in their planning and construction the changing fortunes and aspirations of their builders and the need to attract key personnel. At New Ollerton, developed in the 1920s by the Butterley Company, a factory was erected by them for rent. It was occupied by a hosiery manufacturer, so providing employment for 600 women and girls. As recently as the 1980's output of coal fed not only the by-product industry but also the electricity generating stations along the Trent valley. Coal soon earned its nickname of 'black gold' for it was the raw material, which fuelled the heavy industries and transport essential to the wealth and power of the British Empire. Evidence of this wealth was all too apparent in Nottinghamshire, where a list of the great houses in the county corresponds closely with those whose fortunes came from coal, from Sir Robert Clifton at Clifton Hall to the Seely family at Sherwood Lodge, northwards to the Duke of Portland at Welbeck Abbey. Meanwhile, the lot of ordinary miners was wretched. Before the 1st World War coal production from Britain's 3,024 mines was at its peak. Nottinghamshire coalmines stretched the length of the county and in Eastwood alone 40% of the workforce were employed down the pits but they worked in barbaric conditions and lived in poverty. During the last century it was not unusual for children as young as seven to work a twelve or fourteen hour shift in the mines until finally outlawed. Miners organised themselves into unions and took action to improve pay and working conditions, though their early struggles seemed in vain because the private owners quickly broke agreements. The miner would place the coal into a truck and when full the miner's number would be chalked on the side. Originally coal was mined on a 'butty' system were a butty was a middleman between a gang of half a dozen workers and the proprietors, the miners being paid a fixed rate per ton. 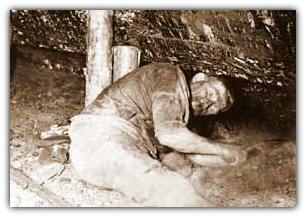 The miner's earnings depended on the season and the amount of coal mined. In Winter a miner may have earned fifty five shillings a week (just under three pounds) at the beginning of this century, although some weeks it could be as low as twenty five. The 'stall and pillar' system was introduced towards the end of the nineteenth century with headings on either side of the shaft leaving a central pillar for support and creating a honeycomb effect. This was eventually replaced by the long wall system where the coal face opened up on either side of a roadway, forming a 'T' pattern. With the coming of mechanisation the coal was taken from the coalface on a flexible conveyor belt to a sloping drift or up a vertical shaft for preparation. There was great optimism when nationalisation took place in 1947. During the 1950's and 60's long needed improvements and modernisation took place at pits right across the county. In the 1950's, 35,000 men worked in the coalfields of North and South Nottinghamshire. But the opening up of the oilfields spelled the end of coal's reign as the major source of fuel. After a brief resurgence in the 1970's and a great deal of industrial unrest in the 1980's, pit closures increased from a trickle to a flood. By January 2000, Nottinghamshire pits were once again privately owned, and only four remained open: Clipstone, Welbeck, Thoresby and Harworth. Between them they employed 1,17 4 men and their combined output was 198,842 tons. Most of the coalmines have now closed and most sites have been completely cleared. Spoil heaps have been reshaped and planted whilst others have been reused as industrial estates. Sometimes, as at Bestwood in the Leen valley and at the American Adventure in Shipley, a solitary winding engine or shaft has been preserved. With the closure of the mines, towns like Bulwell, Heanor, Hucknall, Ilkeston and Kirkby-in-Ashfield fell back on their long established framework knitting, lace and hosiery businesses but even these companies are disappearing. Ex-miners have retrained and taken up a wide range of different jobs from nursing to hotel keeping. They do not miss working underground, but they do regret the loss of the camaraderie and community spirit for which they were famous. They have a fund of stories about working down the pit and are proud to have been part of a once vital industry.